Select the envelope size from the 'Size' selector and the unit from the 'Unit' selector - the dimensions will be shown in the dimensions box. 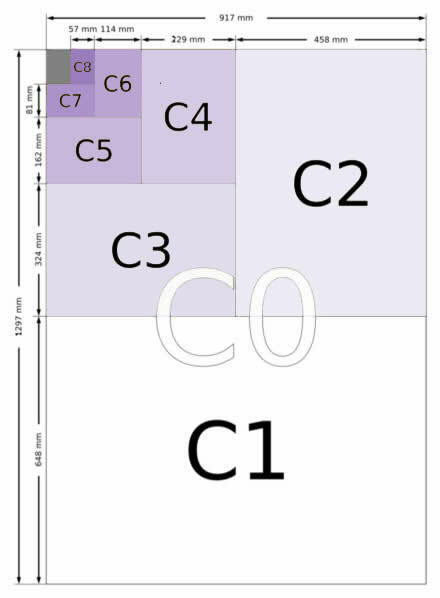 The dimensions of the C series envelope sizes, as defined by ISO 216, are given in the table below right in both millimetres and inches (cm measurements can be obtained by dividing the mm value by 10). The diagram below shows the size of each of the envelopes when compared to a sheet of A4 paper. US & North American Envelope Sizes are not covered by ISO 216 and are covered on this page. C envelopes sizes are defined as the geometric mean of the A and B sizes with the same number i.e. C4 dimensions are the geometric mean of A4 and B4. This produces a size between the two that makes an envelope that will neatly hold the A series paper of the same size, thus a C4 envelope is perfect for an A4 sheet of paper unfolded. It should be noted that C format envelopes also have an aspect ratio of 1:root2 and because of this an A4 sheet folded parallel to its shortest sides will fit in a C5 envelope and folded twice will fit a C6 envelope. One of the most widely used business envelopes, the DL format does not fall under the C series sizes as it has a different aspect ratio. This envelope originated in Germany in the 1920's and was known as DIN Lang, but DL is now more commonly expanded to 'Dimension Lengthwise'. This size is defined in the ISO standards for envelope sizes, as the standard would have been remiss in omitting the most commonly used business envelope size. The dimensions of DL are 110 x 220 mm (4⅓" x 8⅔") and as such the DL envelope will hold an A4 sheet of paper folded into 3 equal sections parallel to its shortest sides.